Scientists of KM3NeT aim at a better understanding of the workings of high-energy objects in our Universe. For this, they will use the ARCA neutrino telescope of KM3NeT that is dedicated to the search for very high-energy cosmic neutrinos. ARCA stands for Astroparticle Research with Cosmics in the Abyss. 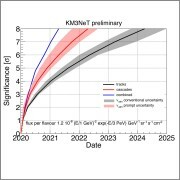 With the superior angular resolution of the ARCA telescope, KM3NeT scientists will study the cosmic neutrino flux providing essential data concerning its origin, energy spectrum and flavour composition. From its location in the Mediterranean Sea, with the ARCA telescope 87% of the sky will be mapped including most of the Galaxy and the Galactic Center, where some interesting unexplained phenomena are observed with other astroparticle detectors. The sea water properties with low diffusion will allow precise measurement of the neutrino direction that is of foremost importance for the discovery of the emitting sources for which no hints are available at the moment. ARCA will be installed at the KM3NeT-It site, about 100 kilometre off-shore the small town of Portopalo di Capo Passero on Sicily, Italy. The detection units of the ARCA telescope will be anchored at a depth of about 3500 m. With an appropiate granularity of the three dimensional arrays of sensor modules in the detector of the ARCA telescope, cosmic neutrinos with energies between several tens of GeV and PeV can be observed. The ARCA telescope will consist of two detector blocks of 115 KM3NeT vertical detection units – vertical lines with a height of about 700 m and equipped with light sensor modules to detect the faint Cherenkov light generated by the charged particles from neutrino induced interactions inside or close to the telescope. Construction of ARCA will proceed in phases adapted to the available funding. The construction of ARCA – with in its first phase 24 of such detection units – has started in December 2015. This first phase ARCA telescope with a detection volume of about 0.1 cubic kilometer will provide a sound demonstration of the KM3NeT technology of cosmic neutrino detection. 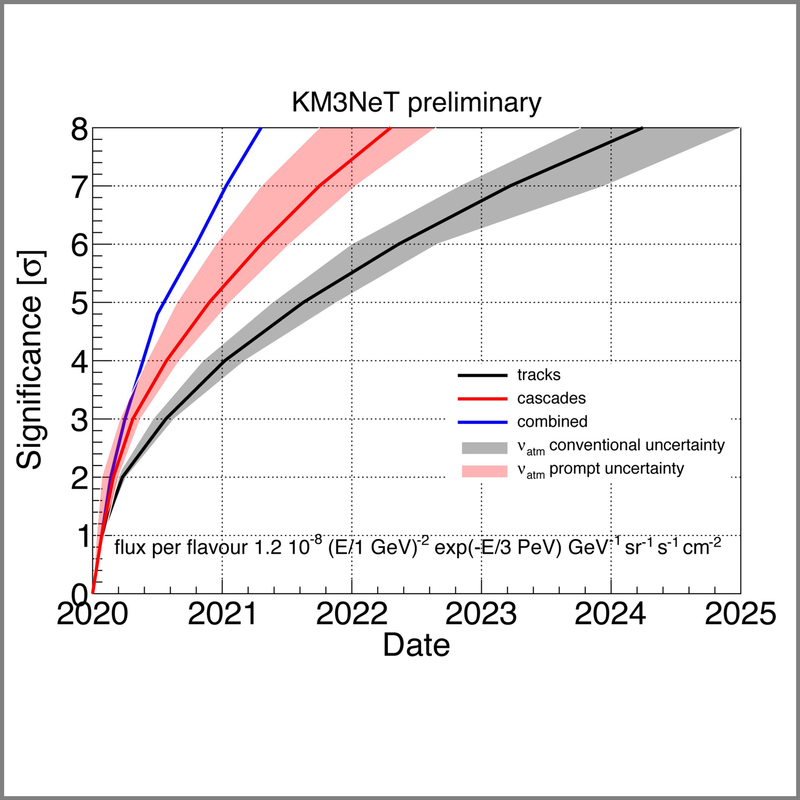 In KM3NeT 2.0, the detector of the ARCA telescope will comprise 230 detection units resulting in an instrumented volume of about 1 cubic kilometre – slightly larger than that of the IceCube neutrino telescope. In the final phase of construction the instrumented volume of the KM3NeT telescope will comprise several cubic kilometres. Currently, the implementation of the full configuration of KM3NeT 2.0 and beyond is partially funded.